Powers/Abilities: That Which Endures is a collective life form, existing within virtually every human on Earth (certain beings have eradicated it from their body via a variety of methods). It possessed a form of sentience almost immediately, but for the most part that intelligence lay dormant. After millions of years it learned to control the process of "natural selection." Once every hundred thousand years its intellect manifests itself within a few hundred random creatures. These beings study the process of life and match the adaptability of one species against another. As assessment is made, those forms they judge to be at their maximum potential are abandoned; their presence within those forms' cells shrinks, dwindling eventually to nothing. Their guiding intellect turns to other, more profitable species. (Avengers West Coast II#48 (fb)) <Four billion years BC> - In the distant past, as life evolved on Earth, the first unicellular creature divided, producing two virtually identical cells. However, while they were genetically the same, there was a difference: one contained That Which Endures. The latter cell then seized the other, consuming it so that only a single cell existed. When the cell next divided, both contained the modification to the matrix of the primal ancestor. (Avengers West Coast II#48 (fb)) <500 Million BC> - The modification was still present, coiled in the heart of every living cell when the diversity of life had begun to manifest itself. (Avengers West Coast II#49 (fb)) - It was present within the fish that developed in the seas, in the plants that where the first to make headway onto land, and in the amphibious creatures that followed. (Avengers West Coast II#48 (fb) / 49 (fb)) - That Which Endures existed in reptilian life, living within the dinosaurs that dominated the Earth. However, it became aware of the existence and potential of mammalian life. (Avengers West Coast II#49 (fb)) <65 million BC> - Seeing dinosaurs as a dead end, That Which Endures shifted its focus to mammals. Without That Which Endures to guide them, the dinosaurs quickly died out. (Avengers West Coast II#49 (fb)) <1 million BC> - That Which Endures narrowed its focus to the ultimate mammal, mankind. (Avengers West Coast II#49 (fb) - BTS) <@ twenty-seven thousand years BC> - When Neanderthal proved unsuitable, That Which Endures shifted to Cro-Magnon. (Avengers West Coast II#49 (fb) - BTS) <decades ago> - That Which Endures awakened within Charles Edison and others, compelling Edison to use his family fortune to purchase Absolom University and convert it to the needs of That Which Endures. Edison took the name of Jeremiah Random and gathered together the few hundred others in which That Which Endures had awakened. Each contributed a small cell sample to develop the Assimilator. The Assimilator provided That Which Endures the means to enter into the body of mutants, so that That Which Endures could abandon mankind in favor of mutantkind. (West Coast Avengers II#44) - Random led the other human pawns of That Which Endures to review a listing of superhuman mutants on Earth, choosing amongst them one who would be powerful enough to accomplish their goals, but not too powerful or unstable so as to prove uncontrollable. They chose the Scarlet Witch (made more susceptible to their control by the recent upheaval in her life (the apparent loss of the Vision). (West Coast Avengers II#46) - Random sent a letter to the Scarlet Witch, inviting her to visit the Absolom College of Robotics, telling her that they might be able to restore the Vision, who had seemingly lost his personality and memories as a result of being disassembled by the agents of Vigilance. (Avengers West Coast II#47) - When Henry Pym proved unable to restore the Vision, the Scarlet Witch took a Quinjet to Absolom College, taking the Vision with her and disabling the Quinjet's tracking device. She was greeted by Random and they went inside for an introduction, after which the Quinjet was crushed and disposed of. However, this alerted Avengers Mansion, and Captain America and the She-Hulk went to investigate. Meanwhile, Random had the Vision taken away from preliminary testing while he led the Scarlet Witch into a chamber where her powers were neutralized and she was subjected to the Assimilator. (Avengers West Coast II#48 (fb) - BTS) - Random's agents told the Vision that the Scarlet Witch had departed on a mission soon after they were separated. (Avengers West Coast II#48) - The assimilation of the Scarlet Witch proceeded apace, including the physical modifications and memory reconstruction of That Which Endures. As Captain America and the She-Hulk arrived, Random distracted them, leading them on a tour of their hastily assembled "College of Robotics." They even met with the Vision, who assured them that nothing was wrong. Captain America and the She-Hulk decided to come back and investigate that evening, unannounced, but by then the assimilation was complete; the Scarlet Witch incapacitated them both. However, Mockingbird received a transmission of the Avengers Quinjet emergency signal, and she and Hawkeye led their trainees, the Great Lakes Avengers, to investigate. (Avengers West Coast II#49) - While both Captain America and the She-Hulk had been faking incapacitation to learn what was going on, the She-Hulk was affected by the assimilator, activating the racial memory of That Which Endures within her. She assaulted Captain America (whose Super-Soldier Serum had eradicated That Which Endures), distracting him so that Random could stop him with a stun gun. Meanwhile, the Vision, having been left alone by Random's agents for over seven hours, began to suspect treachery and flew into the air to see if he could locate the Scarlet Witch's trail. He was seen by the approaching Great Lakes Avengers, who followed his lead in heading back to Absolom College. While the rest of their allies struggled against the She-Hulk, Doorman and Mister Immortal invaded the facility. Ignoring the lethal radiation surrounding the Assimilator, Mister Immortal entered its chamber, destroying it. Instantly, the collective intelligence of That Which Endures faded back into dormancy, releasing all those formerly under its sway. Sadly, Mr. Immortal was killed by the lethal radiation. Fortunately, as per his power, he was back to life, good as new in about ten minutes. Norvo noticed a reference to That Which Endures, in Sensational She-Hulk#8: "It seems obvious She-Hulk is referfing to her guest shot in Avengers West Coast#47 etc., in which she fought That Which Endures, who used "guys in three piece suits doing nasty things" for hosts. The dates also work: AWC#47 came out in May, 1989, with SSH#8 having a cover date of mid november 8." These events are not mutually exclusive (and the Earth X and Ultraverse ones are moot). While the presence of Asgardians around 65 million BC doesn't make sense, the meteor fragments could have been magically sent back in time. Also, time may not function the same way in a magical realm like Asgard. Anyway, That Which Endures' decision and the struggle between Gaea and Set could have occurred concurrently. The magical energies of the Mjonlir forge, combined with (and possibly drawn through time to/by) the struggle between Gaea and Set, brought forth either one immense comet or a fierce meteor shower that pelted Earth. Without Set or That Which Endures to back them, the dinosaurs rapidly died off. That Which Endures might have jumped the gun in deciding that dinosaurs were at an evolutionary dead end. Modern archaeologists studying the size of their larger brains and eye cavities in the fossil record believe that if they had continued to evolve that they might have developed human characteristics inclined to civilization. Indeed, Marvel has depicted many reptile alien races such as the Skrulls and the Snarks as well as other-dimensional worlds where races evolved from dinosaurs. The TV series Star Trek Voyager also explored this idea in an episode from the series. That Which Endure's decision that the dinosaurs were a dead end was also flawed because birds are dinosaurs, meaning that dinosaurs are now more diverse and more numerous then they have ever been (especially when you consider all the forms that survive in the Savage Land). 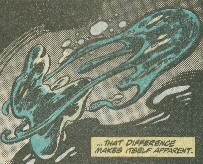 Several characters also possess a power over dinosaurs which should extend to birds, such as Stegron. Hmmm...never thought of this before, but I wonder if Mister Immortal could have any connection to Morgan MacNeil Hardy. He's not reborn as a child, though. That Which Endures has an entry in OHotMU 2006 A-Z#11. The identity established by Charles Edison while under the influence of That Which Endures, he used his family fortune to purchase Absolom College and convert it to development of the Assimilator. He spent decades working with others within whom That Which Endures inhabited, eventually deciding that mutantkind was the way to go, and choosing the Scarlet Witch to become the template from which they could affect the rest of mutantkind. He served as the face-man for That Which Endures' plot, and the identity was abandoned after he regained his own mind when the Assimilator was destroyed. Though Edison was seen as innocent of the crimes committed under the influence of That Which Endures, he nonetheless had lost half of his life and all of his wealth.